Plan a picnic party at the end of summer. An end of summer theme party can help bring the summer to a close and can provide a fun way to make the leap into the fall season. An end of season party offers one last hoorah before the days begin to shorten and cooler weather sends people inside. When most people think of summer, they associate the end of the season with the Labor Day holiday. 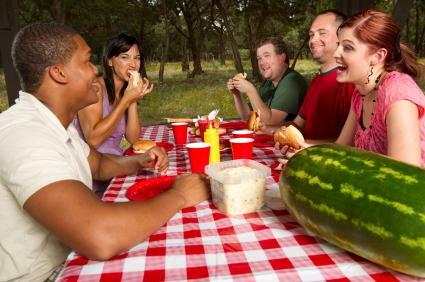 Labor often means a three-day weekend for many people, and this allows a bit more leeway in the party planning process. For anyone who needs a theme on which to focus a final summer gala, Labor Day provides the perfect excuse to have fun. One family can be in charge of beverages and a dunking booth. Another family can grill hot dogs and man the limbo challenge. Still another family can offer chips and dip while monitoring the horseshoe toss. Simple streamers, balloons and decorative signs are usually enough to jazz up the space beyond the different stations. Music may not be absolutely necessary for this type of party since guests will be circulating the block, but it might be fun to offer karaoke during the afternoon. Be sure you check with your local government and find out about any ordinances for or against block parties since you'll need to close off the street to traffic. Hopefully, your company participates in the three-day weekend idea, so consider spending the day with your co-workers having fun instead of working. This party shouldn't be exclusively for employees, but instead be extended to family and friends. If possible, host the party on the grounds of the company. If not, reserve a park, including pavilion and picnic tables, that's large enough to accommodate everyone who will attend. Consider having the event catered with smoked chicken and white sauce, baked beans, potato salad, and peach cobbler for dessert. If catering isn't an option, ask for volunteers to man the grill for hamburgers and hot dogs, and ask guests to bring the general finger food fare, such as chips and dip, side salads and desserts. Decorations can be minimal, such as balloons to designate the party area, and torches or lanterns can add a nice touch as well as a little light if the party will entend into the evening. If your company is willing to sponsor the event, hire a DJ to provide a wide range of music for all the guests to enjoy. End of summer parties don't have to be on Labor Day. There are plenty of other exciting ideas to incorporate into your theme. Kids may not be ready for the summer to end, but the inevitable first day of school is just around the corner. A back to school bash is the perfect venue for renewing friendships and meeting the new kids on the block. Reserve a local neighborhood pool for an evening party, complete with pool games, ice cream sundae bar, homemade ice cream, fudge and caramel toppings, sprinkles, chips and dip. and brownies. Reserve the local skating rink for a night of skating fun. Most rinks have party rooms that are included in the reservation, so bring in drinks, cupcakes and chips as well as other snack foods. Host a back-to-school dance in your school's gym. Parents can chaperone, and kids can dance the night away. Serve punch, finger sandwiches and cake for kids to snack on. Decorate with hanging stars, disco balls and streamers. End of summer party themes provide the perfect excuse for letting loose and celebrating the end of one season and the beginning of the next. Backyard fun: Set up a large canopy in the backyard, add strings of lights, and crank up the music or hire a DJ. Serve hot wings with blue cheese or ranch dressing, and set out trays of cut vegetables, deli meats, cheese and crackers, and potato skins. For dessert, rent or purchase a cotton candy machine. Beach bonfire: Head to the beach and set up a bonfire. Invite guests to bring along their musical instrument of choice and sing and dance the night away in the moonlight. Roast hotdogs, and make the classic s'mores dessert. Top off the night with an array of fireworks. Remember to check out the legalities of the bonfire and the fireworks. Favorite decade party: Rev up the phone by inviting guests to come to your summer party dressed to represent their favorite decade. Play a variety of music from each decade, and let guests compete in costume and dance contests. Hang up posters from popular movies from that decade or featuring famous actors in their youth. 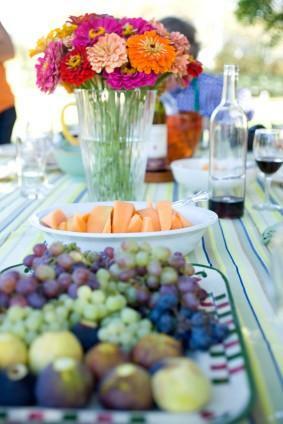 No matter the venue or the theme of your summer soiree, it is important to plan accordingly. Allow yourself plenty of time to organize all the details. Enlist the aid of family and friends in the planning stages. Choose age appropriate activities, and touch base with each guest to ensure that everyone has a wonderful time.